Creed 2 Poster Has First Look at Ivan Drago Jr.
UPDATE: Though officially shared by Sylvester Stallone, the following poster is not officially from the studio and was created by a fan. The original story follows as initially launched over the weekend. Michael B. Jordan is having quite the weekend. Black Panther, which features his portrayal of the villainous Erik Killmonger, is tearing up the box office and now Sylvester Stallone has just released the first poster for Creed 2. Black Panther director Ryan Coogler directed the first Creed movie, which was an unexpected hit, making the sequel highly anticipated by fans. However, there's more to be excited about this time around as Dolph Lundgren's Ivan Drago returns along with his son Drago Jr. (Florian Munteanu) and the new poster provides our first look at the father and son team. It was revealed last month that Romanian fighter Florian Munteanu, aka "The Big Nasty," will be playing the son of Ivan Drago in Creed 2. 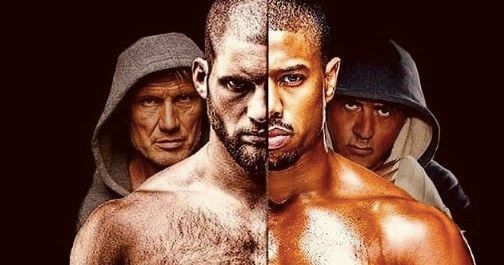 Sylvester Stallone released the first poster for the movie and it features Munteanu's Drago Jr. next to Michael B. Jordan's Creed with Stallone and Dolph Lundgren behind the two fighters. The poster is dark and gritty with a short caption from Stallone that simply reads, "It's fight time." Steven Caple Jr. is taking over for Ryan Coogler to direct Creed 2 after it was previously thought that Sylvester Stallone would helm the project after posting a picture of the script that he had written last summer. Cheo Hodari Coker (Luke Cage) helped punch up the script with Stallone while Coogler will remain on board as an executive producer for the project. Production for Creed 2 is expected to begin next month and has an official release of date of November 21st, 2018. It's only a matter of time before pictures from the set are revealed, which will more than likely come straight from Sylvester Stallone's Instagram account. In a recent interview, Michael B. Jordan admitted that he thought that his career was over when he was 14-years old. Jordan was excited to get cast on The Wire, but he was devastated when his character was killed off after 12 episodes. He had this to say. "(Creator) David Simon came over and said, Look, man, I love you. Everybody loves you. But we've got to kill you. I started crying. I thought my acting career was over. I told everyone that I might never work again." Black Panther isn't the actor's first foray into the comic book movies as he played the Human Torch in 2015's Fantastic Four, which didn't do very well. Michael B. Jordan and Ryan Cooler first worked together on Fruitvale Station. Creed 2 is all set to begin production after Michael B. Jordan finishes the promotional campaign for Black Panther. For now, there's probably a lot of training going on for all involved in the Creed sequel. While we wait for the inevitable set photos from the excited Sylvester Stallone, you can check out the brand-new poster for Creed 2 featuring a first look at Ivan Drago Jr. below from Sylvester Stallone's Instagram account.